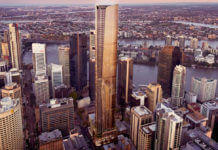 Walker Corporation has submitted a DA for two residential towers located on the Austral Motors Site (801 Ann Street, Fortitude Valley). The site occupies an entire block, bounded by Ann and McLachlan Streets running north to south, and Connor and Morgan Streets running east to west. According to the DA, the proposal for the site takes the adjacent “Mac & Ann” development’s scale, bulk and height into consideration and also acknowledges that the sites opposite on ann Street will likely be developed to similar or greater heights and densities. The 801 Ann Street site represents the opportunity for a transition in scale between the heights proposed deeper in the Fortitude valley heart precinct, the sites opposite on Ann Street, and the lower scales of the New Farm sites opposite on McLachlan Street. 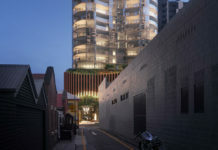 The proposal also recognises that the ground plane of the site can act as a conduit for pedestrian connectivity throughout that portion of Fortitude Valley, allowing cross-block flow and tying into the laneways system prevalent within “Mac & Ann” and other local burgeoning retail and dining precincts. Therefore the ground plane of the proposal is highly activated through addressing the street frontages and including a human-scaled courtyard on the Connor Street edge that will create a sense of place and a retail heart for this block/development, in use day and night through varying activities. The development includes seven ground floor retail tenancies as well as a plaza and two cross block link laneways. 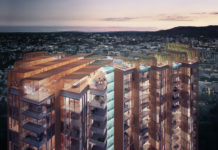 Designed by Cox Rayner Architects, the development includes a podium level recreation deck with pool and BBQ area as well as rooftop recreation decks on each tower. The DA number for this development is A004031978. FYI this was designed by COX Rayner Architects not Cottee Parker.